The concept of Carla Pellegrino's; it's an Authentic Italian Neapolitan Cantina (Casual homemade Italian dining room) to create an atmosphere that draws people from all over the country to experience the best regional Italian cooking. Dining at Carla Pellegrino's BRATALIAN Restaurant should be an experience that few other restaurants could match; from the minute customers cross our doors, he/she should be brought back in time to a wonderful ethnic community where friends and family come together to enjoy the basics of life, food, and family. The Carla Pellegrino's concept will be seeking a return of those lost bonds. People who come to visit our establishment will be reminded of their own history regardless of where they come from. They will remember the butcher and the baker down the block in their neighborhood; they will be reminded of their parents and grandparents, they will find as well the romantic Mediterranean Country Style that will remind them of Italian islands and remarkable landmarks luch as Amaufi Coast and Portofino. The constant presence of the Executive Chef Carla Pellegrino at the restaurant leading her kitchen brigade and greeting our guests, will establish comfort, coziness and friendship between patrons and staff. 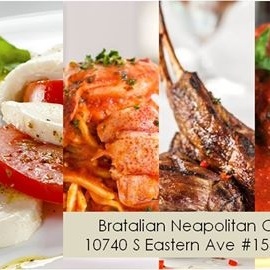 The goal of BRATALIAN's Restaurant it is more than a restaurant, it offers a time and a place that connects everyone to their roots, and it feels like home.